The WRI Ross Center for Sustainable Cities’ Sustainable and Livable Cities Initiative supports key leaders in China, India and Brazil in improving urban quality of life and environmental sustainability. WRI’s blog series on the Initiative will highlight some of the projects that are working to create better cities. Cities are starting to get serious about curbing climate change. In the past two years, more than 500 cities worldwide have joined the Compact of Mayors, a coalition committed to ambitious climate action. This year, the Compact of Mayors merged with Covenant of Mayors to form the new Global Covenant of Mayors, with more than 6,000 cities and municipalities. This global group joins the many regional and national initiatives dedicated to city-level climate action, such as China’s Alliance of Pioneer Peaking Cities(APPC), a group of more than 20 Chinese cities that have committed to peak their greenhouse gas (GHG) emissions ahead of the national target year of 2030. But with all these great commitments comes the next logical question: How to put them into action? 4) track performance on a regular basis. Practical guides and tools such as the Global Protocol for Community-Scale Greenhouse Gas Emission Inventories (GPC) can help cities implement each of these steps. More than 500 cities – with a total combined population of 400 million and nearly 3 billion tons of annual GHG emissions –have committed to measure their emissions using the GPC to develop action plans to reduce emissions and publicly report on their progress. 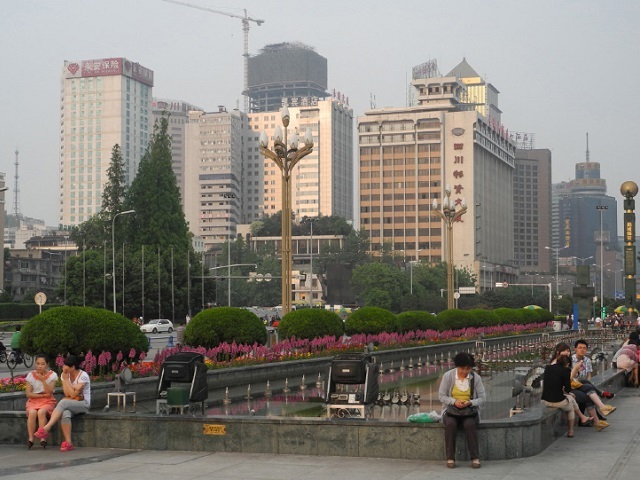 Chengdu, China, is leading by example with these four steps to low-carbon planning. With a population of over 14 million, Chengdu is one of China’s largest cities in China, and rapid industrialization and urbanization brought a decades-long increase in GHG emissions. That started to change in 2011 when Chengdu partnered with WRI’s Sustainable and Livable Cities Initiative. Chengdu Development and Reform Commission developed its first greenhouse gas inventory in 2015 (based on 2010 data). This inventory revealed valuable insights about the sources of the city’s emissions. For example, it was found that Chengdu’s electricity is quite low-carbon because more than 70 percent of it is hydroelectric. So shifting industries toward electrification could be a way to further reduce Chengdu’s carbon emissions. Using the inventory results, Chengdu then created a detailed analysis to forecast its potential future emissions trajectories under different economic, energy and mitigation scenarios. It found that controlling emissions from construction materials manufacturing and chemical industries are among the key measures needed to peak the city’s emissions. In terms of energy mix, limiting oil consumption and increasing electrification will lower the emissions peaking level. Based on the analysis, Chengdu committed to an ambitious target to peak its emissions by 2025, which officials announced at the China-U.S. Climate-Smart / Low Carbon Cities Summit in June. Then, Chengdu developed a detailed roadmap and action plan for achieving the target that includes measures such as setting an energy cap, establishing a smart grid, instituting low-carbon transport and constructing green buildings. This year, Chengdu will update its greenhouse gas inventory with 2015 data and institutionalize a mechanism for tracking performance. To help tackle climate change, more cities need to take action as Chengdu has. International platforms like the Compact of Mayors and the new Global Covenant of Mayors can help, but there’s also a role for national governments. National governments need to link cities’ actions to national policy to get buy-in from political stakeholders at all levels of government. That will help cities leverage in-country policies and financing mechanisms. Linking city actions to national policies can also expedite change. For example, China has made low-carbon cities a top priority for its national climate agenda. In 2011 and 2012, the National Development and Reform Commission selected 42 cities and provinces to join the National Pilot Low Carbon Cities Program. This program’s success prompted the Commission to add about 50 new cities this year. All these cities and provinces will set emission peak targets ahead of the national 2030 target, demonstrating how national governments can help deliver results at scale. Curbing climate change is a herculean feat. While countries have reached consensus on the Paris Agreement, tackling global warming will ultimately require on-the-ground action in countries and cities. More cities should join Global Covenant of Mayors and APPC cities to ratchet up their actions in line with the Paris Agreement. The Sustainable and Livable Cities Initiative was made possible through the generous support of the Caterpillar Foundation.